"Some kids have a harder time getting to a school than others, not for any fault of their own, but because of the way the transportation system is set up, because of the way crime clusters in particular places," explains Julia Burdick-Will, a sociology professor at Johns Hopkins University and the lead author of the study. "It might not be huge, or every day, but it adds up." She and her team looked at how neighborhood crime in Baltimore affects attendance. The vast majority of students there use public transportation (like many urban school systems, Baltimore City Public Schools don't bus students). Researchers mapped the routes high school freshmen took to and from school — what streets they were walking on, when and where they picked up a bus, when they transferred, etc. Then, researchers applied crime data by location and time of day to see how those findings related to student absences for the year. They discovered "kids who are supposed to be walking along streets with higher rates of violent crime are more likely to miss school," Burdick-Will explains. The Baltimore school district struggles with getting kids to show up: 37 percent of students were chronically absent last school year, meaning they missed at least 10 percent of school. Research shows students who miss that much school are way more likely to fall behind and eventually drop out. Burdick-Will says, "When we think of attendance we often think of a kid not wanting to be there." But this research shows other factors may be at play. As school choice gains popularity, students are going to schools farther and farther away from their homes. And, Burdick-Will explains, "Getting kids to school is going to have to be something that we pay more attention to as we open up [school] choice options." Research by the Urban Institute found that, in cities where school choice is a popular option, black children often travel farther and longer than their white and Latino classmates. In Baltimore, where all high schools run on a school choice system, students spend, on average, more than 35 minutes getting to school, and they have at least one public transit transfer, according to Burdick-Will. And kids who travel through high-crime areas face another challenge: They can't always take the most direct route. "They know that it's dangerous to go to this bus stop, and so they go in a different direction and they have an extra transfer," Burdick-Will says. "Or they have to rely on a ride that sometimes falls through." The latest national numbers suggest that nearly 8 million children in the United States are chronically absent; that means about 1 in 7 students are missing 15 or more days of school each year. External factors, like neighborhood crime, are important, explains Hedy Chang, the executive director of Attendance Works. But, she says, schools still need to be looking inward. 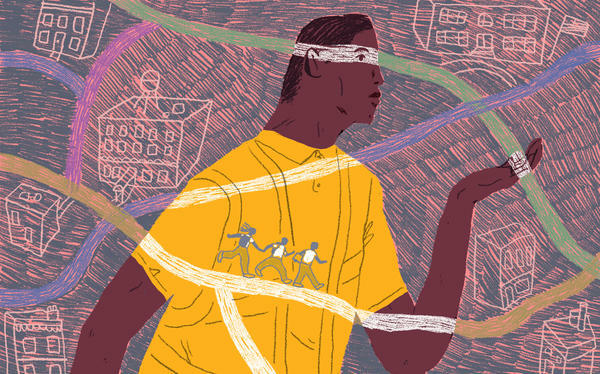 "If we make schools better — safer — more inclusive and trauma-informed, students will want to be there." And if students want to be there, Chang says, maybe they'll be more willing to walk those extra blocks to avoid high-crime areas. Perhaps they'll also feel comfortable talking to teachers and staff about the obstacles they face on their way to school. Some cities are experimenting with ways to help students get to school safely. In 2009, Chicago Public Schools started Safe Passage, a program that places adults along highly trafficked routes to schools. The idea was to make those paths safer for students and help boost attendance — and it worked, according to research and data from the district. But Safe Passage has its limits. A lot of Chicago students walk to school, while in Baltimore students are mostly taking public transit and only walking a few blocks to and from a bus stop. That means districts need to be creative when they're looking for solutions. "The public transit system isn't always designed with students in mind," says Burdick-Will of Johns Hopkins. Public transit schedules often revolve around work commute times, and sometimes stops aren't placed in convenient locations to walk to a school. But Burdick-Will's Baltimore data does show high-traffic transfer locations, where students switch from one bus to another. Burdick-Will points to those transfer locations as an opportunity to bring more adults to the school commute. "Adult supervision matters a lot for kids," she says. As her previous research has shown, just having an adult there can go a long way in helping kids feel safer.